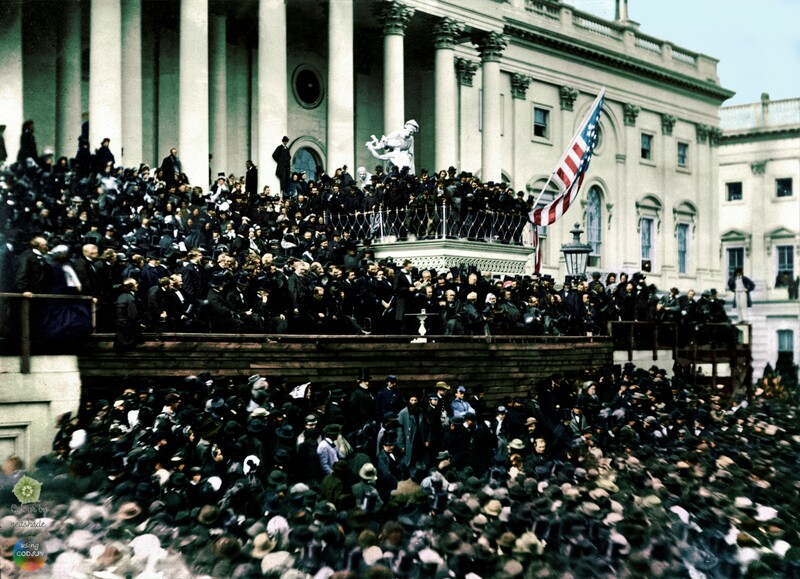 Abraham Lincoln’s second inaugural address, 4th March 1865,taken by Alexander Gardner. On 9th April, General Robert E. Lee surrendered, practically ending the American Civil War, and 5 days later Lincoln was killed. 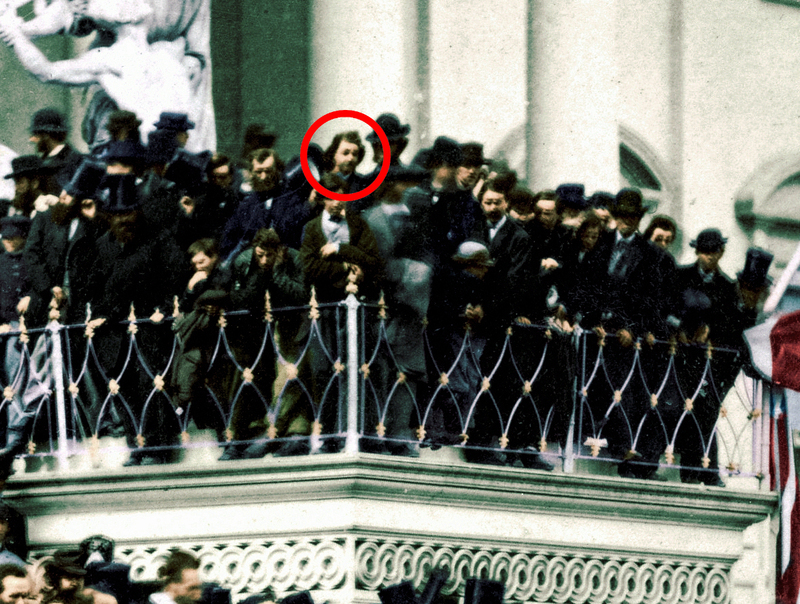 His assassin, John Wilkes Booth, is reputed to be in this photo. 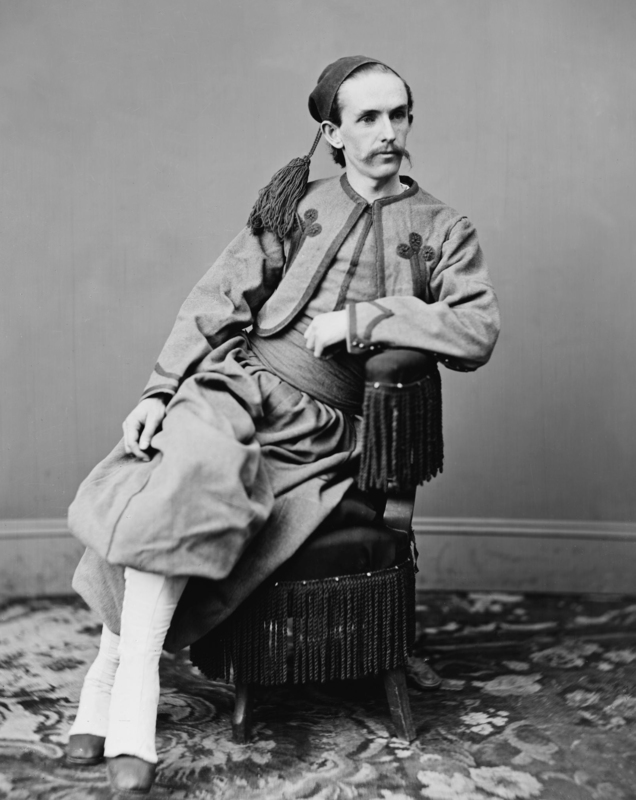 John Harrison Surratt, Jr. was certainly involved in the plot to kidnap Abraham Lincoln in 1864, but there was sufficient doubt in his involvement in Lincoln’s assassination in 1865 that, when extradited from Egypt, after something of a world tour of escaping, in early 1867, he was released on $25,000 bail and the case against him for murder was declared a mistrial. All the other charges relating to the kidnap plot had passed the statute of limitations. This photo was taken in 1867, while Surratt was on, or awaiting, his trial. He is still wearing the uniform of the Papal Zouaves (Pope’s infantry), with whom he had briefly served while on the run, using the alias John Watson. Original B&W photo from the Brady-Handy Photograph Collection. Nimrod Burke was born a free man in Prince William county, Virginia in 1836. His family moved to Washington County, Ohio, in 1854. Nimrod found employment as a handyman in Marietta, a little over 10 miles from the family home in Newport, and was only able to visit at weekends. His employer was a prominent lawyer, and abolitionist, by the name of Melvin C. Clarke who, at the start of the American Civil War in 1861, was appointed a Major in the Union Army. Nimrod would have joined the army too, but blacks were not eligible to serve as soldiers, Instead, knowing that Nimrod had been raised in Virginia, hired him as a teamster-scout for the 36th Ohio Volunteer Infantry, who then went to Tidewater Virginia to fight the Confederates. 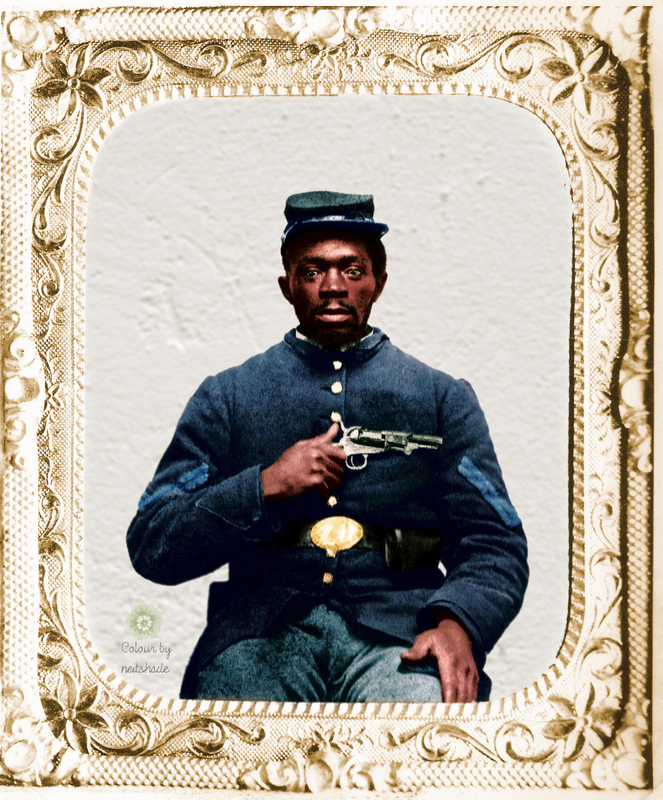 Then, in 1863, War Department issued General Order Number 143 which allowed the recruitment of African-American soldiers to fight for the Union Army. 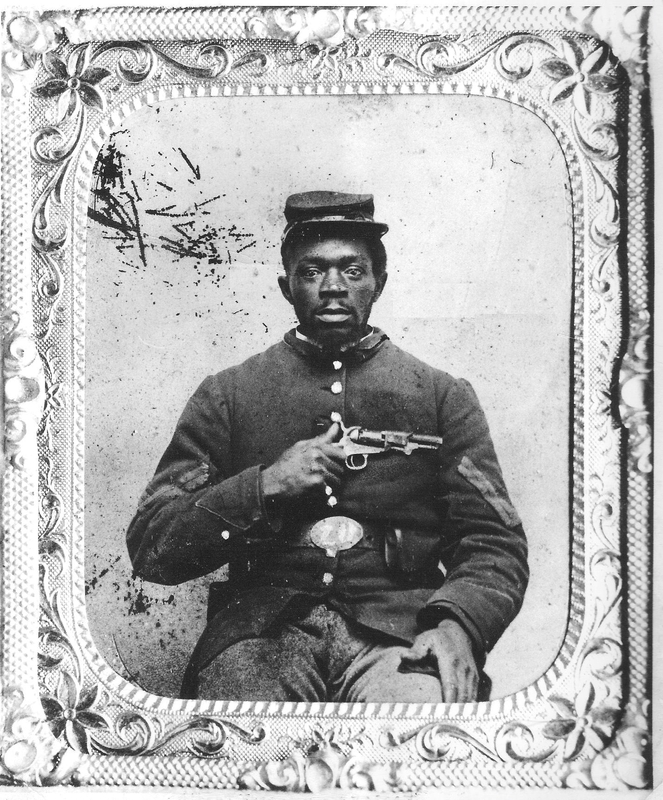 Nimrod remained a scout until 1864, when he joined Company F of the 23rd Regiment, United States Colored Infantry, where he was assigned the rank of sergeant. In an ironic twist of fate, Nimrod, and his regiment, were in attendance at Appomattox Court House on April 9, 1865, when General Robert E. Lee surrendered the Confederate Forces. The neither man would have been aware of it, Nimrod’s family were freed by an ancestor of Lee’s, Robert Carter III, around 1793. 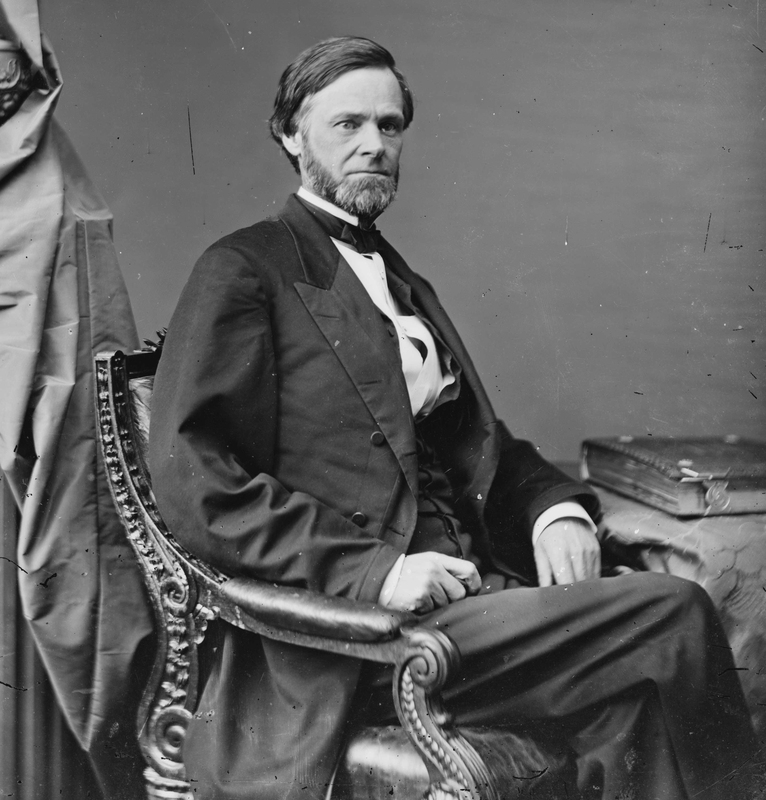 Senator John Sherman, pictured between 1861 and 1865. Sherman mainly concerned himself with financial matters throughout his political career, but two finance Acts were particularly significant in the Civil War. The Confiscation Act of 1861 allowed the government to confiscate any property, including slaves, that were being used to support the Confederate war effort. The Second Confiscation Act of 1862 clarified that slaves “confiscated” under the 1861 Act were freed. 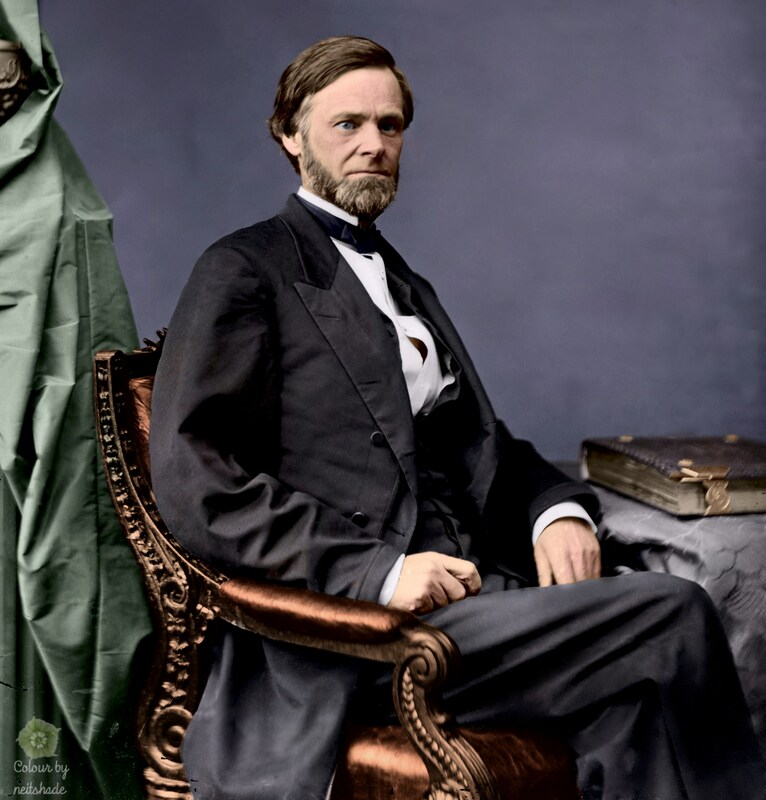 He also supported the Thirteenth Amendment to the United States Constitution, which abolished slavery, in 1864. Original daguerreotype from the Brady studio. 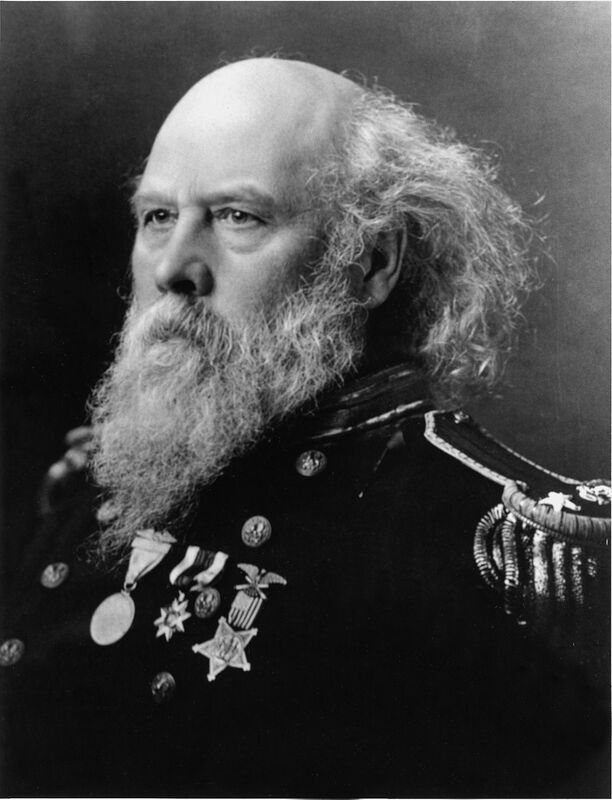 Rear Admiral George Wallace Melville, US Navy, probably in 1904 or shortly before. 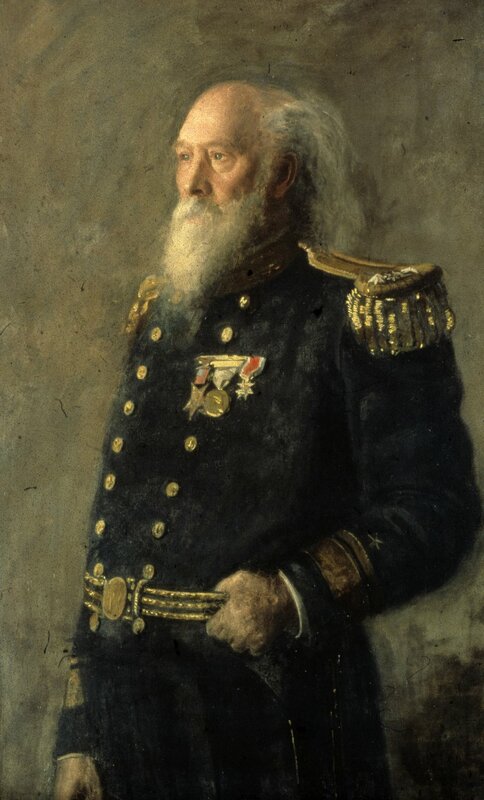 (See painting below), entered the U.S. Navy in 1861 and became an officer of the Engineer Corps, and took part in the capture of CSS Florida in 1864. 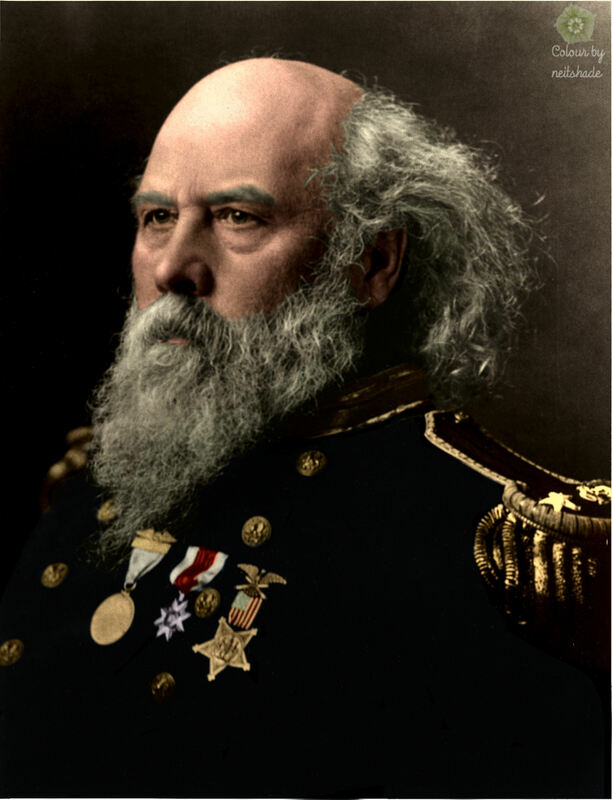 As well as being an engineer, Arctic exploration and author, Melville reformed the Navy, making it more efficient and more professional. The 1904 painting by Thomas Eakins from which I took the colours. 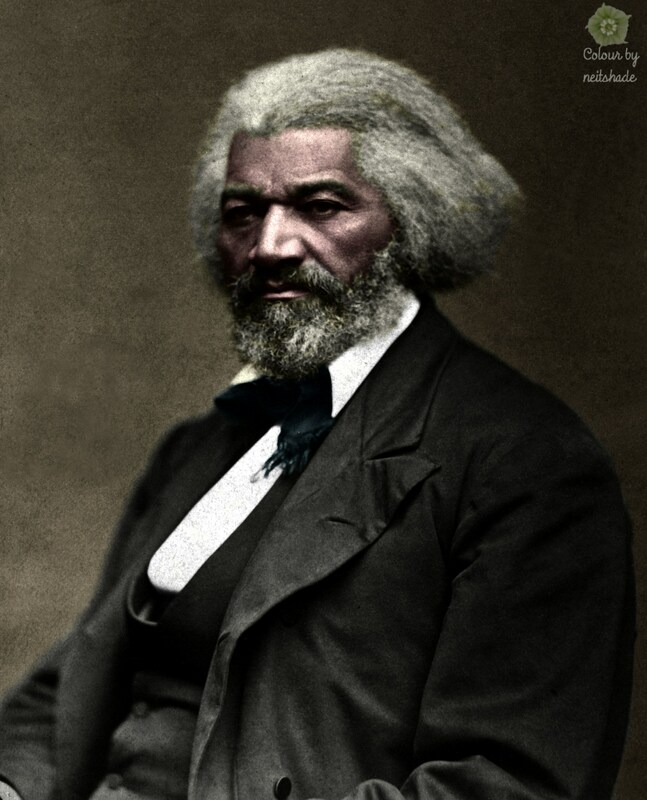 Frederick Douglass, around 1874. 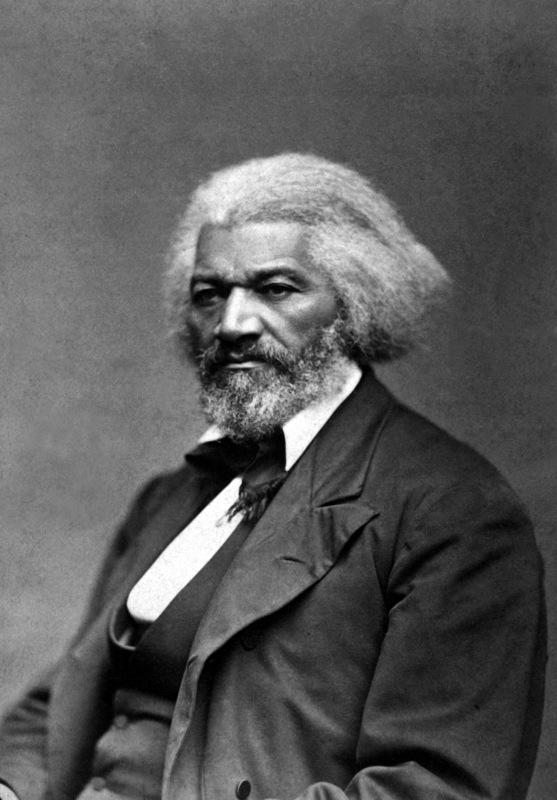 Born a slave, he first escaped to the north then, while on a lecture tour of Britain and Ireland, he was able to buy his freedom in America, using donations from British supporters. He was also given money for several abolitionist publications back in America. In one, he published a scathing letter to his former owner, Thomas Auld. A few years after this photo was taken, in 1877, Douglass visited Thomas Auld on his deathbed, and the two men were reconciled. As important as he was in the story of the abolition of slavery, he was also a staunch campaigner for women’s rights. Copy of the original daguerreotype. 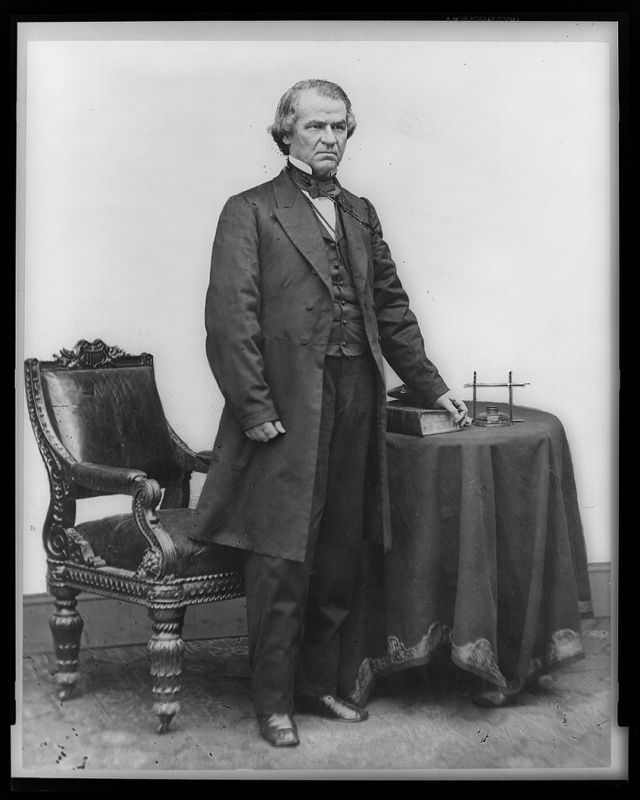 Andrew Johnson, the first American president to be impeached, though he was acquitted in the Senate by one vote.